Though it's often confused with its unpedigreed cousin, the Domestic Shorthair, the American Shorthair is a breed unto itself and one of the oldest U.S. breeds, thanks to its mousing prowess. Their ancestors might have come over with the pilgrims on the Mayflower, helping to keep early settlers' ships pest-free. They also hunted mice for California gold-miners. The American Shorthair is a classic—truly a cat for all seasons. Her affectionate but independent nature makes her a great choice for a variety of households. This breed can grow to between 8-12 pounds and lives an average of 15-20 years. Playfulness: Did someone say “toy?” Yes, please! WHAT IS THE AMERICAN SHORTHAIR'S PERSONALITY LIKE? This breed is the Platonic ideal of cat: American Shorthairs are moderate in temperament, build, type, and size. They're good at keeping themselves amused and can be a great first-time cat or cat for a busy family. They're loving but not suffocatingly effusive; they're active but not climbing your drapes. The American Shorthair is an intelligent and independent cat's cat. WHAT IS AMERICAN SHORTHAIR'S BEHAVIOR LIKE? These cats want to spend time with you, but they don't need to be all over you. They're versatile and not particularly chatty. This is an athletic breed who prefers getting around on her own four paws, thank you very much. And if there's a bug in the room, GAME ON. HOW CAN I KEEP MY AMERICAN SHORTHAIR ENTERTAINED? American Shorthairs often make their own fun, but with any cat it's important to give them appropriate outlets for their natural behavior. Yours might enjoy learning to use that scratching post you brought home, stalking a feather you drag across the floor, or outsmarting a puzzle toy for treats. Given this cat's strong hunting instinct, consider toys and training that involve letting her use her skills—stalking, pouncing, hunting, and batting. WHAT DO AMERICAN SHORTHAIRS LOOK LIKE AND WHAT ARE THEIR GROOMING NEEDS? This breed has a medium-to-large build with green or golden eyes whose short, dense coat protects her against cold temperatures. 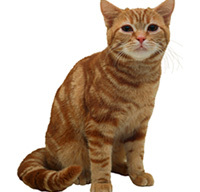 American Shorthairs have 80+ patterns and colors, but all have (you guessed it) short hair. They do best with weekly brushing and combing to remove extra fur. Your cat's coat and skin can tell you a lot about her health and well-being. Healthy cats have coats that are smooth and shiny; they should have supple, clear skin. Nutrition and wellness factor heavily into the texture and luster of your kitty's coat, but you can help keep her looking and feeling her best with regular skin care and grooming. WHAT HEALTH PROBLEMS DO AMERICAN SHORTHAIRS HAVE? Though generally healthy, some American Shorthairs are susceptible to heart disease. Your American Shorthair's parents should be tested for hypertrophic cardiomyopathy. They're also not the most active breed, so be mindful about portion control. Remember that cats often hide disease symptoms! It's important to bring your furry friend in for veterinary checkups at least once a year. ARE AMERICAN SHORTHAIRS GOOD FOR PEOPLE WITH ALLERGIES? American Shorthairs aren't among the breeds generally recommended for allergy sufferers. Remember that no breed is 100% hypoallergenic, and any breed can aggravate allergies. You can reduce your furry friend's impact on your allergies with daily brushings. This will reduce pet dander and loose hair landing on your clothes and furniture. (Bonus: think of the money you'll save on lint rollers.) If your pet allergies are mild, a regular grooming session could have a big impact on your quality of life with your pet. WHAT IS MY AMERICAN SHORTHAIR'S BEST DAY? She'll happily spend a day watching the birds from a sunny window ledge, tracking that bug that's caught in the window screen, or following you around the house, chirping for her second dinner. SHOULD I ADOPT AN AMERICAN SHORTHAIR? If you want a cat's kind of cat—the one that will catch the spider in the bathroom and curl up beside you on the couch, but you think pedigree is important, the American Shorthair is who you have in mind. This versatile breed fits into just about any cat-ready household. If you're looking for a frills-free cat with an all-American family tree, you'd be hard pressed to do much better than an American Shorthair. Have you decided that an American Shorthair is the purr-fect cat for you? Why not be your new best friend's hero and adopt a rescue! Be sure to check out our article on what to expect when you're adopting a dog or cat.